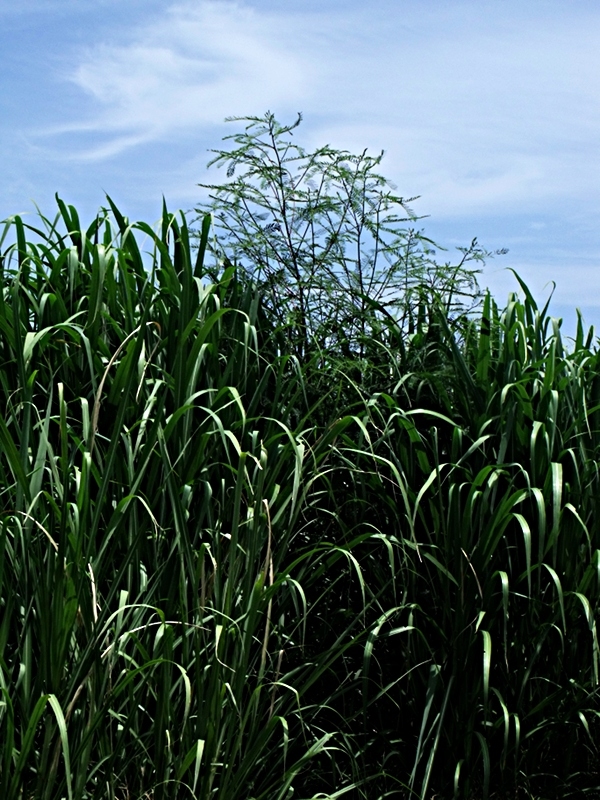 Sesbania cannabina growing with sugarcane. Reforestation.me – about complementary plant combinations, companion planting, allelopathy, agroforestry, forestry, climate change, reforestation, agriculture. Fast-growing high biomass plants, and complementary plant combinations, including over- and under-storey combinations. Pigeon pea Cajanus cajun and maize grown mixed together produce more grain than either grown by itself (after 24 weeks: maize 3130 kg/ha, pigeon pea 1871 kg/ha, mixture 3735 – 4460 kg/ha). Oelsigle et al 1976, in Tivey 1990. Sorghum, millet and probably many other crops and pasture grasses grow better under nitrogen-fixing Faidherbia albida and Prosopis cineraria trees (and probably other similar trees, eg. Albizia spp., Sesbania, Robinia, Enterolobium, Adenanthera, Parkia spp., some Acacia spp. etc.). Faidherbia trees have the added advantage of dropping their leaves at the beginning of the wet season/growing season. This provides a mulch (which may increase water retention, water infiltration, aeration, reduce erosion, and moderate soil temperature) adding organic matter and nutrients, as well as allowing light through the canopy at the beginning of and through the growing season, for crops or pasture growing beneath the canopy. 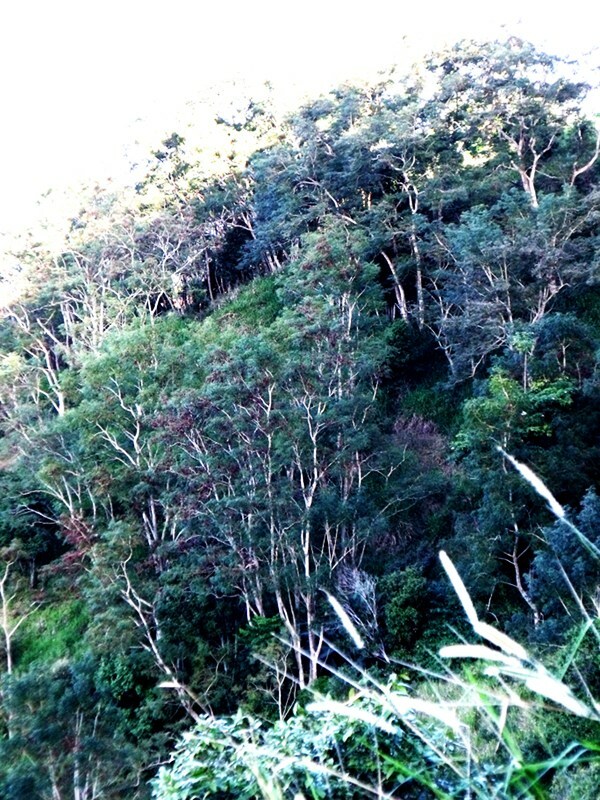 and Binkley, Debell, Dunkin, Ryan: “Production and Nutrient Cycling in Mixed Plantations of Eucalyptus and Albizia in Hawaii”(1992): http://warnercnr.colostate.edu/~dan/papers/forestscience_38_1992.pdf (this link may not work but it should be easy to find on Google scholar). Falcataria moluccana (syns. Paraserianthes falcataria, Albizia falcataria, Albizia moluccana). Photo: juragansengon.wordpress.com. Where Falcataria moluccana is not available (or could become a weed), a tree form of Leucaena (possibly K8, K636, K584, ‘El Salvador’, or ‘Tarramba’), or Enterolobium spp., or Adenanthera pavonina, or Sesbania grandiflora, may be effective substitutes (possibly Robinia pseudoacacia and Alnus spp. in cooler climates, with conifers, poplars etc.). Probably many tree/plant species that are nitrogen-fixing, and have small leaves (large surface area to volume ratio and therefore quick to decompose and release nutrients for another species of tree growing next to it) will work, at least in soils that are naturally loe in nitrogen. Death and decomposition of roots and nodules underground, providing nitrogen and organic matter may also be a primary factor. It could be that such trees will also enhance the growth of timber tree species other than Eucalyptus, when mixed together. An arrangement of a row of Eucalyptus, Falcataria, Eucalyptus etc. next to a row of Falcataria, Eucalyptus, Falcataria etc. would mean that for each Eucalyptus tree, the nearest four trees would be Falcataria trees, which should make the Eucalyptus grow faster. This may complicate management and harvesting, but could result in greater overall productivity. It may also work for other species of non nitrogen-fixing trees mixed with other species of nitrogen-fixing trees – there are many possibilities that could be tested, some may work, and some may not – perhaps mahogany (otherwise slow growing) and Sesbania or Leucaena, Caribbean pine and Falcataria, Teak and Falcataria, Australian Red Cedar (Toona ciliaris) and Falcataria, Paulownia and a nitrogen-fixing tree, etc. 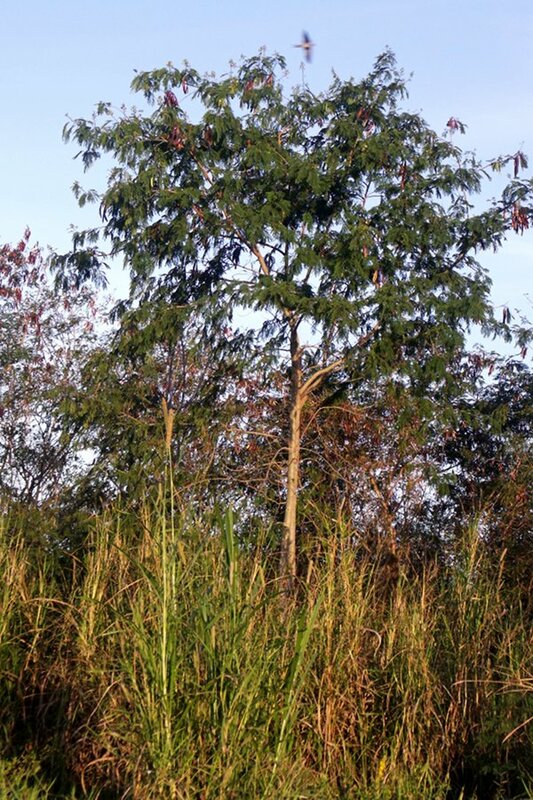 and Kumar et al: “Intercropping teak with Leucaena increases tree growth and modifies soil characteristics.”: http://www.springerlink.com/content/v3m3j32082277m18/ . See also Erskine et al “Tree species diversity and ecosystem function: Can tropical multi-species plantations generate greater productivity?”: 51006274. In this paper it was found that tree growth, measured as mean basal area, was on average 55% greater in mixed species plantations compared with monocultures. The best results (in North queeensland, averaged to eight years old) were Agathis robusta (a tropical Aust. conifer) at 115% increase, and Eucalyptus tereticornis at 63% increase in mixed species plantations. A row of A. robusta, then a row next to it of E. tereticornis, and then, especially in soils low in nitrogen, a row of n-fixing trees (e.g. Falcataria moluccana, Leucaena leucocephala, Acacia mangium, A. crassicarpa etc. ), and then the same sequence repeated. In colder climates perhaps a row of Agathis australis, then Eucalyptus globulus (or E. regnans or E. saligna, or E. grandis etc. ), then perhaps a nitrogen fixer, e.g. Acacia melanoxylon or Robinia pseudoacacia. The following rotation should avoid repeating the same species in the same row. The design should theoretically result in a 55% or greater increase in mean basal area. Possibly slow-growing valuable timber spp. 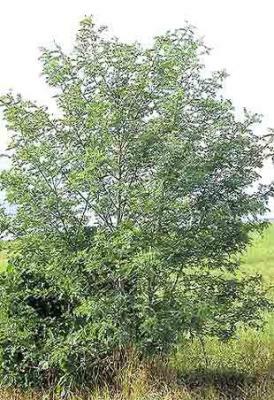 such as Mahogany and Black Walnut might grow faster in mixed species plantations. Wheat-faba bean mixed cropping, Barley-fab bean intercropping, Crop productivity and land use effciency of tef-faba bean mixed cropping. (Thank you to Getachew for providing these papers). This research suggests that a combination of Faba beans (broad beans Vicia faba) and some cereals may be more productive than either grown alone. 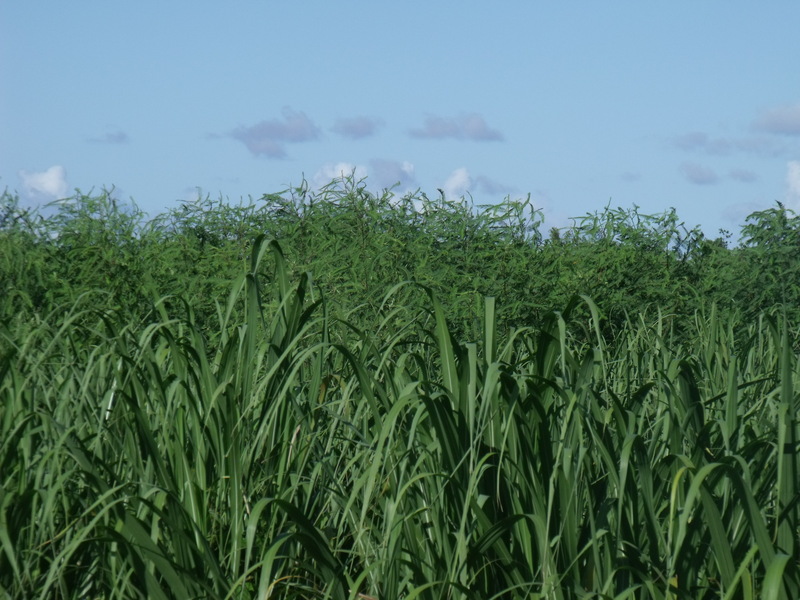 This adds weight to the broader idea of combining grasses and legumes generally, and perhaps even that most non nitrogen-fixing plants grown with nitrogen-fixing plants, will result in greater overall biomass/productivity. Faba beans themselves may prove to be useful, perhaps with sterile ryecorn or sweet sorghum (S. vulgare, which commonly produces up to 30t/ha/yr DM) for example, established from seedballs deposited in gaps between trees, in the first stages of reforestation of degraded sites in cooler climates. 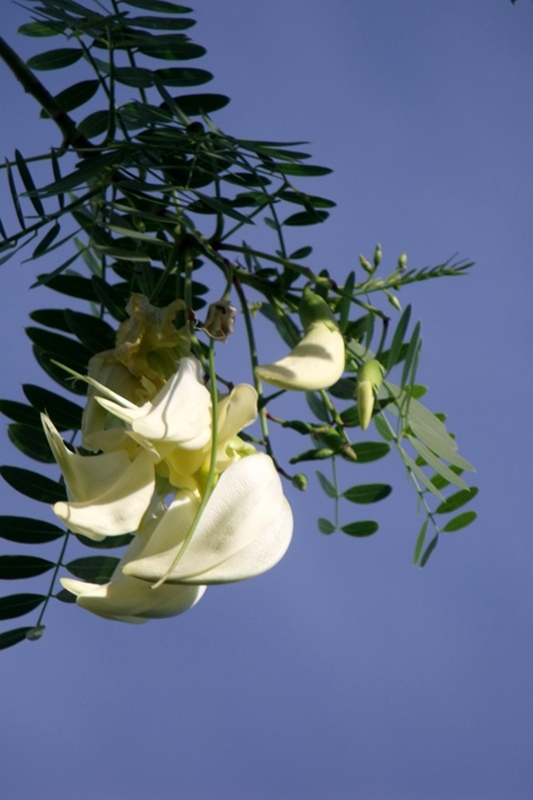 Research into mixed improved fallows at two sites in western Kenya found that a combination of Sesbania sesban with Crotalaria grahamiana, and another combination of Cajanus cajun with Macroptilium atropurpureum, produced more above-ground biomass than monocultures of the four species. Biomass production over 15 months ranged from 4.1 to 20.5 Mg/ha for monoculture, and 7.8 to 23.3 Mg/ha for mixed species fallows. In these mixed fallows, the sesbania and cajanus would have grown as an over-storey to the other species. 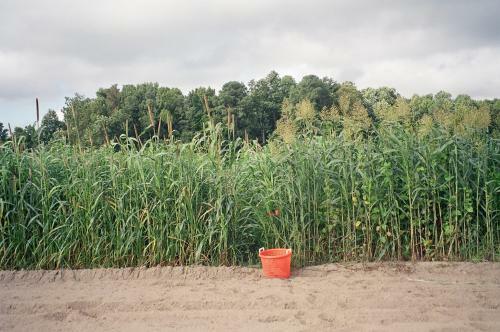 Sorghum-sudan grass plus Lablab purpureus (right of bucket). The Lablab bean appears to be complementary to the grass, and the combination seems to be fixing more carbon/producing more biomass, than the grass by itself, with the bonus of soil fertility improvement through nitrogen-fixation. Photo: Mark Schonbeck, extension.org. 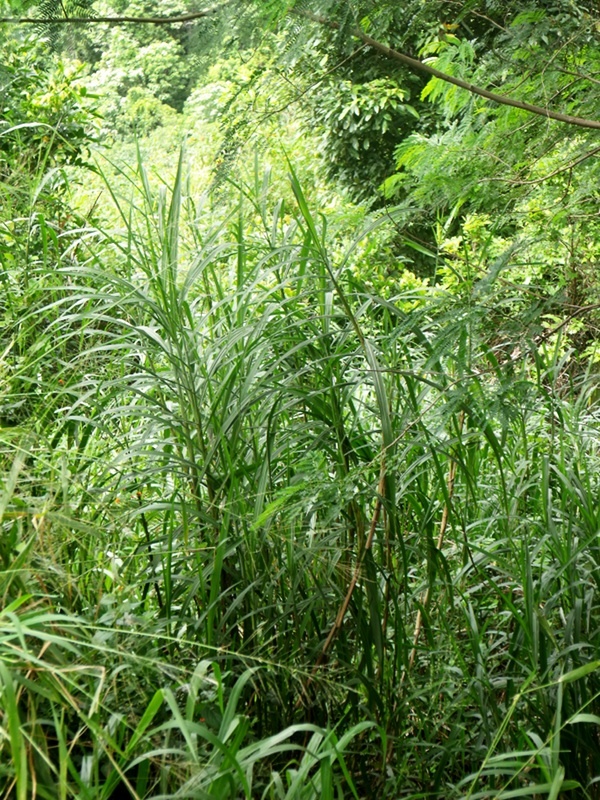 Another example of a complementary plant association (or companion planting) includes cocoa and coffee growing better under the shade of nitrogen-fixing trees such as Leucaena spp., Falcataria, Gliricidium etc. Some plants attract beneficial insects or other beneficial wildlife and indirectly help other plants, some repel pests, helping other plants nearby etc. A green manure crop or mixed improved fallow could also be seen as complementary in the sense that the fallow/green manure plants complement/improve the growth of plants that follow. The tree, Adenanthera pavonina, growing as an over-storey to the grass, Panicum maximum. The trees drop nitrogen-rich leaves, which provide fodder for livestock and fertilize the grass below. 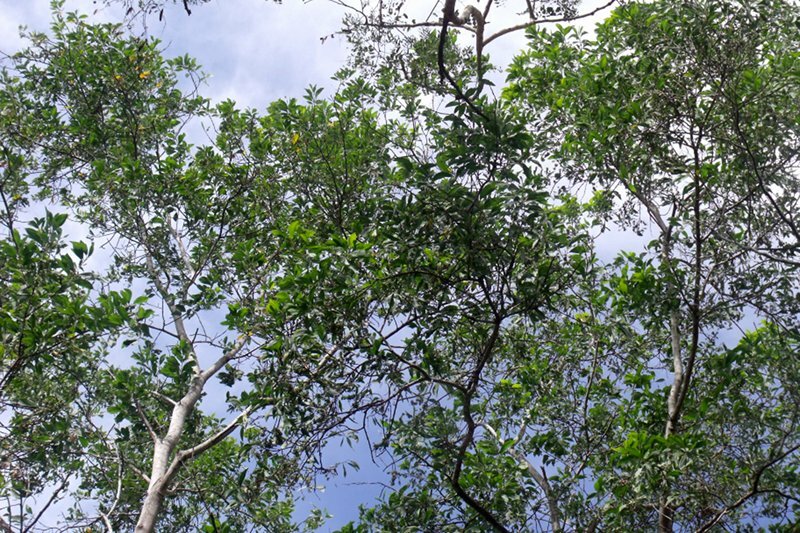 This tree has a fairly open canopy, and loses most or all of it’s leaves in the dry season, allowing more light through for understorey species. The grass flowers in the foreground are Napier grass, Pennisetum purpureum. Pennisetum purpureum grass, apparently growing better under an overstorey of Leucaena leucocephala trees, than in the open nearby. 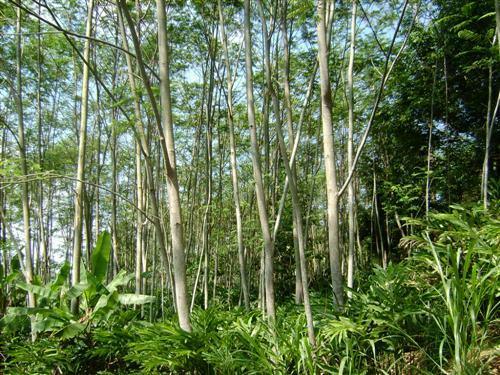 No apparent retardation of the growth of Leucaena either. 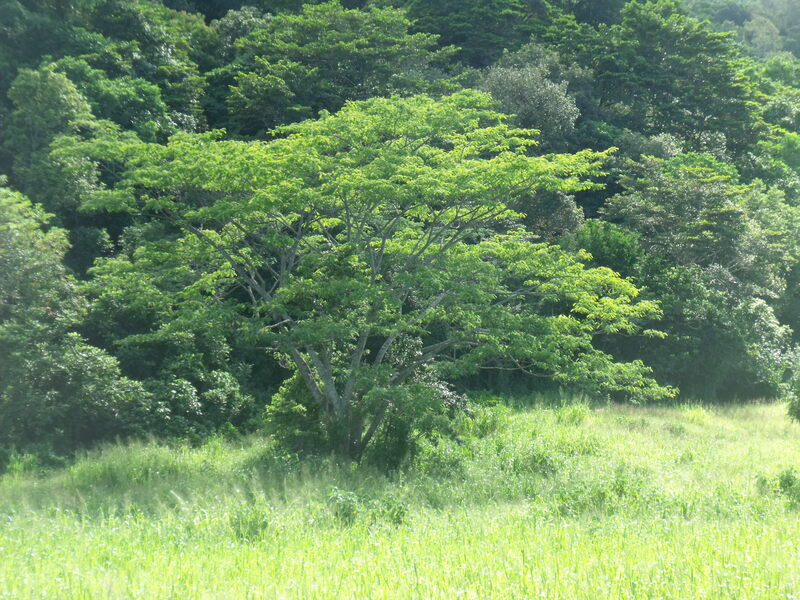 The Leucaena would be fertilizing the grass with its nitrogen-rich leaves, and adding organic matter to the soil. Campbell’s lookout, Cairns. This would be a very high biomass producing combination, resulting in greatly increased soil fertility and an improvement in soil structure. Same as above, but a different site (North Cairns). The annual, nitrogen-fixing Sesbania cannabina, growing faster than sugar cane, and overtopping it. This photo is a representative sample of the same thing happening all around this site. Neither plant appears to show reduced growth, compared to others growing separately nearby. Presumably the biomass produced by the combination is greater than that which would result from a monoculture of either. Captain Cook Highway, just north of the Barron river bridge, Cairns. The uses of bamboo are only limited by one’s imagination. 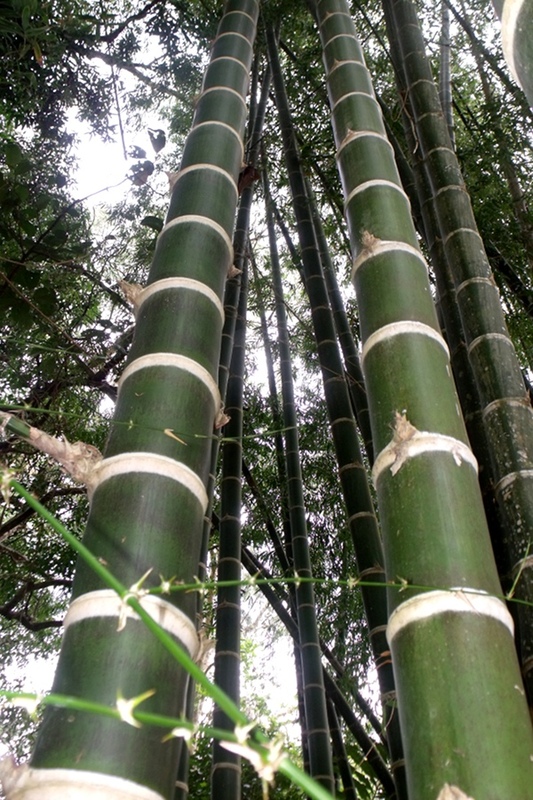 Bamboos are generally very fast growing, especially in the wet tropics/equatorial regions, and the combined carbon fixation of some types of bamboo, with an over-storey of Falcataria trees, are likely to be staggering, and make a joke of pine plantations in cooler, temperate or subtropical climates (often used as a “straw man” example to try and discredit the idea of reforestation as a solution to carbon dioxide emissions). See the AID plus seeds article, pages 9 – 12. Cairns botanic gardens. 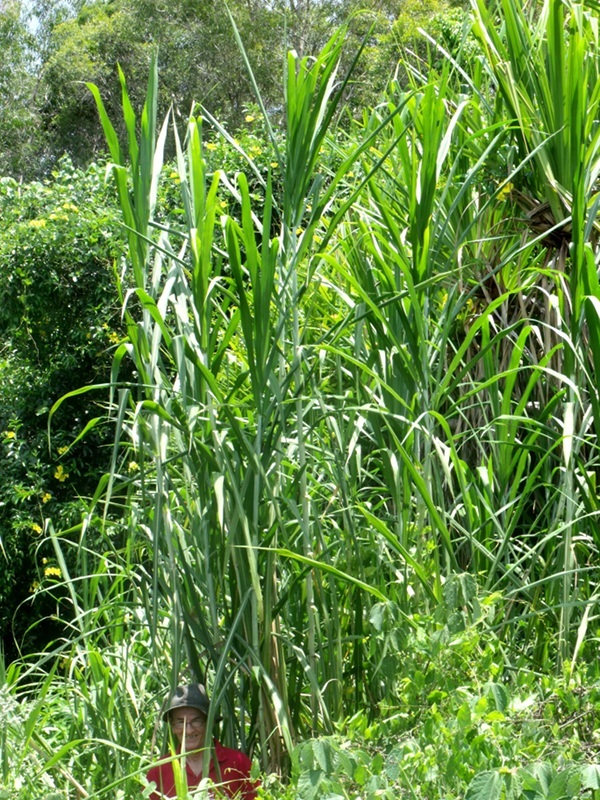 Bambusa balcooa is being uesd in India and South Africa for fuel to produce electricity. 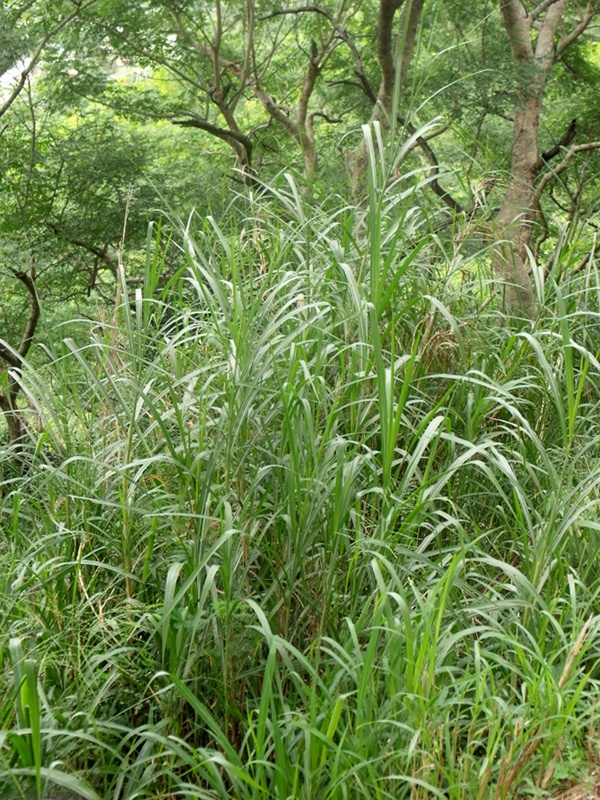 Paraserianthes toona is closely related to Falcataria moluccana, which, according to the Guiness book of records, is the fastest growing tree in the world (speed in attaining height – a tree in Indonesia grew to ten metres tall in thirteen months – many bamboos and other grasses are faster than this). Eucalyptus trees growing with Falcataria may grow up to 2.5 times as fast – see reference higher up on this page. Nitrogen-fixing trees drop nitrogen-rich leaves to the ground, providing additional fodder, and fertilizing the grasses beneath. Many drop nutritious pods for animal fodder, and some are edible for people (e.g. Inga spp., rain trees, Parkia spp.). Sesbania grandiflora. A fast-growing, nitrogen-fixing tree, with edible flowers and fodder for livestock. Often grown on bunds around rice paddies in S. E. Asia, and during the dry season may lose some of its leaves, allowing more light through to plants beneath. Sesbania sesban is very effective in tropical Africa in improved fallows (see photo below). 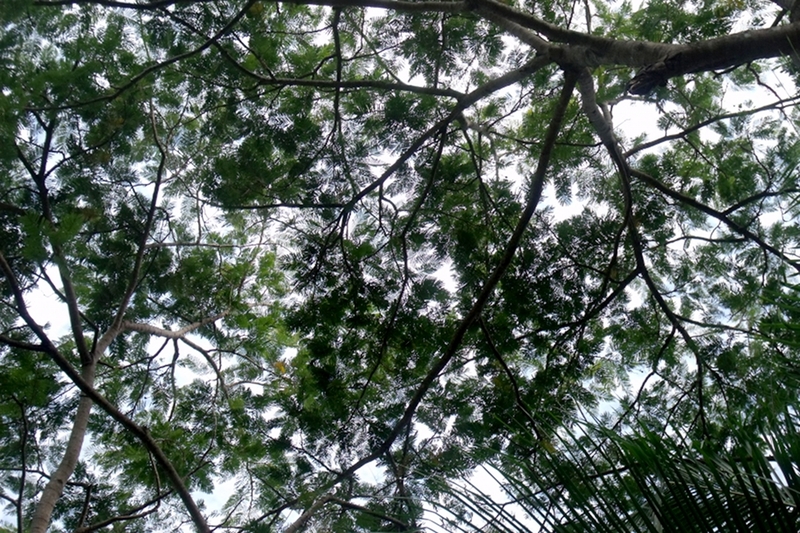 The relatively dense and shady canopy of Parkia javanica. This beautiful Asian nitrogen-fixing tree produces pods which are edible for people. The foliage and canopy of Enterolobium cyclocarpum from Central and South America lets more light through, and tends to be deciduous in the dry season, allowing more light through for understorey growth. The fabulous Faidherbia albida tree has the advantage of being deciduous in the wet growing season, allowing light through for crops or pasture. Millet and maize under Faidherbia can be twice as productive, or more – see “evergreen agriculture”, (“Home” page, “Links” page, “Articles” page) . Acacia mangium, canopy after 15 years, Aeroglen quarry, Cairns, Australia. This tree is one of the most important timber trees in S. E. Asian plantations and could be a major component in reforestation projects (at least in the wetter Northern parts of Australia). 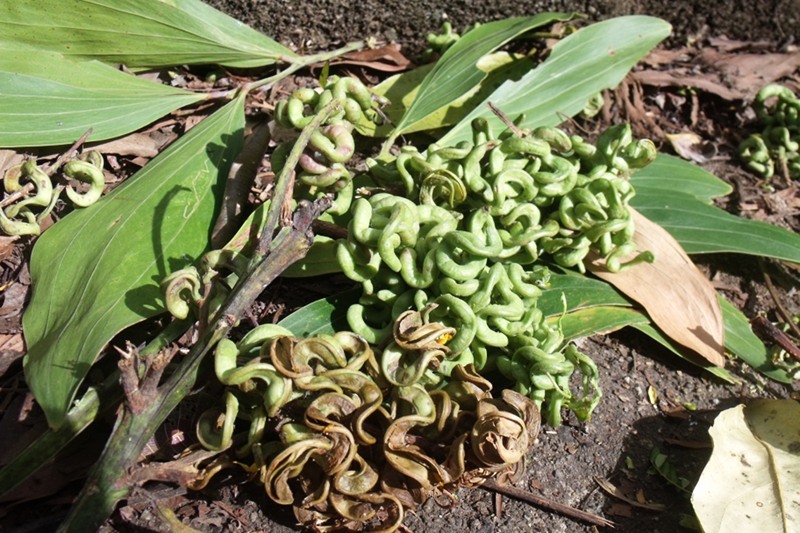 The photo below shows the leaves and pods. The protein-rich seeds and seedpods of this adaptable nitrogen-fixing tree are a vital food source for many birds and small mammals (see photo below). 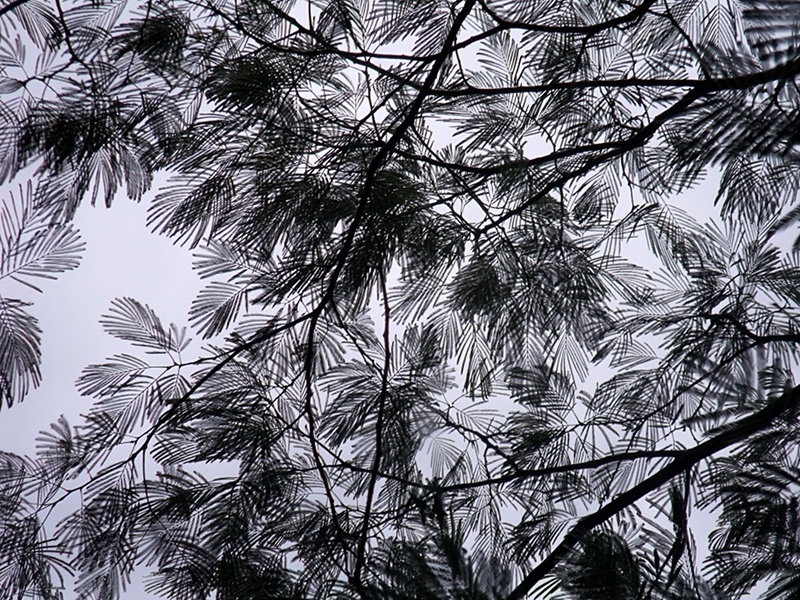 Acacia holosericea would be one of the toughest and most adaptable species suited to reforestation in the tropics. Many nitrogen-fixing legumes are suited to seed dispersal by livestock. Prosea no. 11 Auxiliary plants. Twivey, J. (1990). Agricultural Ecology. Longman Scientific & Technical. ISBN 0-582-30163-7. Pge 112. Seed pods and leaves of Acacia mangium. Your input is appreciated, thanks guys.